I had a bit of fun with this Photo and the theme this week. A beachcomber! And indeed he has a very fine view. 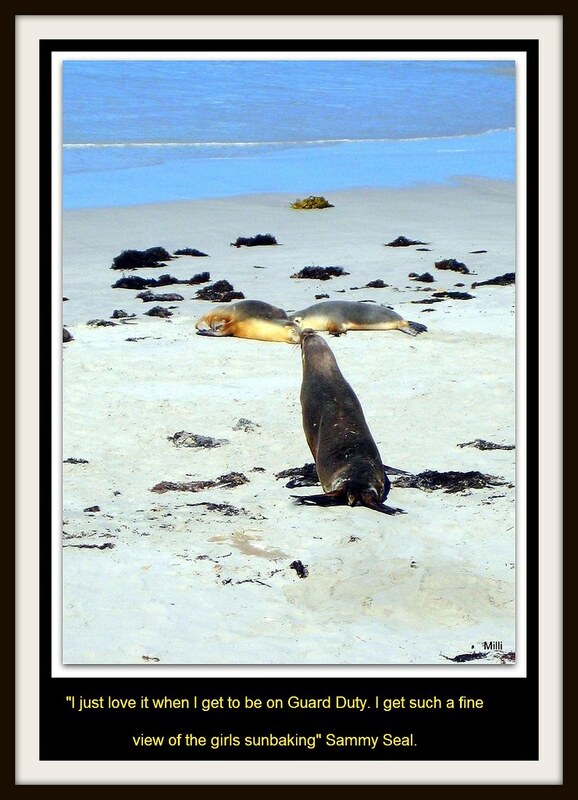 As one seal said to another, let's tie the knot. Beautiful View, That's One Lucky Guard "Sammy The Seal" Giggle~!! I think he is missing the most Beautiful view though. him that is a Beautiful View, Giggle~!! fantastic! And I love the words! hehehehe! Cool photo and the quote is very funny. Great sense of humor! Such wonderful colors in your photo! Love it. An entry with a sense of humor. Oh that's a fantastic shot, Milli! I understand your fun, very well!!! Perfect words, too!! Nice T-formation. How long did it take you to train them to do that? Your so funny. What a neat shot. You got so close to them. Sammy Seal has a watchful eye. the seal in the foreground like the body, Phew!! lol, perfectly adorable! I love it!!! Thanks everyone for you neat comments here. Lol, he's so sly ;-). Great shot and words.